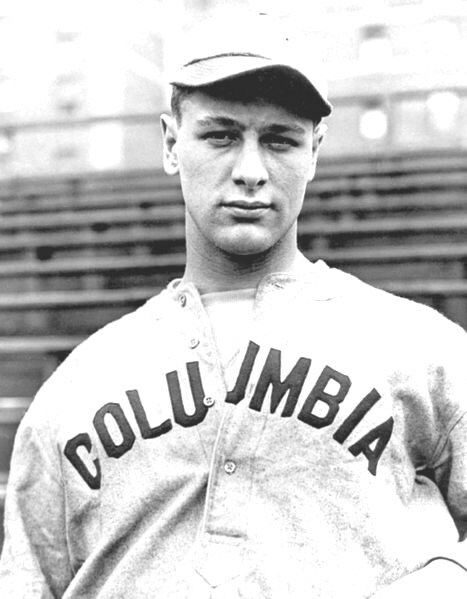 Lou Gehrig was one of baseball's great players. His parents didn't want him to make a career of baseball. They thought it was a waste of time, but he loved the game. He was on his high school baseball team. A talent scout saw him and offered him a sports scholarship* in college. The family didn't have much money because his father was ill. His mother was a cook at the college, and Lou waited on tables to help pay his way. 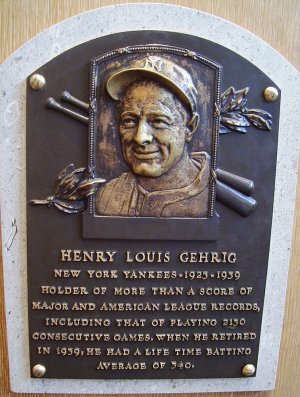 He started playing for the New York Yankees in 1923. His parents scraped together $14 for him to make the trip to spring training camp in New Orleans. When he got there, he started looking for a job, but the team paid him some money in advance. (They usually paid the players at the end of the training camp.) He was able to concentrate on practicing and improving his skills. He played in every game for 14 years without missing even one. He played over 2000 games. That was a record which wasn't broken for 50 years. But then something bad happened. He could barely swing the bat and he couldn't run around the bases any more. He knew something was wrong. He went to specialists. * They said he had a disease called ALS. The long name for it is amyotrophic lateral sclerosis (am e uh TRO fic LAT er ul skler O sis). It attacks the nerve cells in the brain and spinal cord* and the person becomes unable to move. Death usually comes in two to five years. He knew he would not be able to continue playing baseball, so he resigned. * The Yankees held a special day in Yankee Stadium on July 4, 1939 to honor him. In his speech he said his career in baseball made him "the luckiest man on the face of the earth". That same year he was voted into the Hall of Fame. Players were usually not voted into the Hall of Fame until after they had been retired for two years. Even though he could no longer play baseball, he continued to work. He took a job serving on the New York State Parole Commission. * He kept working until he died in 1941. It is said of him "his character was beyond reproach". * This means no one could say anything bad about him, because he was such a good person. The disease ALS became know as "Lou Gehrig's Disease". At biography.com search for Lou Gehrig. Press "Go" to search for books about Lou Gehrig. Picture courtesy of Wikimedia Commons. This page displayed 148,917 times.